This little, beautiful, working locket with a place inside for 2 little pictures, to hold her family and friends close. With delightful pink enamel inside it will be a sweet surprise and a precious gift for any girl. Includes free engraving on the front, optional engraving on the back. Beautiful little locket, but it is extremely tiny!! It is much smaller than my five year old’s other lockets. I understand this is a child’s locket, but it’s simply too small to enjoy the photos inside, which btw it was difficult to size down photos small enough to fit. I made a photo copy of the locket and used that as a template to cut the photos to the exact size I needed. Please make a larger size locket! My daughter fell in love with it despite its size. Very nice. Great quality. Easy to place pictures inside. Beautiful sterling silver, monogrammed locket with fast delivery given personalization. New mom loved the locket for her baby and even mentioned ordering one for a friend who just had a baby! Definitely recommended! Excellent service. Beautiful product. Received quickly! I ordered this locket at the request of my Daughter-In-law . I was pleasantly surprised at the quality and craftsmanship. My grand daughter loves it. My one year old and I love this necklace! It was the perfect gift for her 1st Dedication. I'm definitely ordering from here again! The locket is just charming! It's so much better than I expected. The packaging is very expensive looking which definitely adds to the overall rich look of the locket. I received the locket in only a few days & that was with the specialized engraving, which by way was beautifully done. I would highly recommend this product and company. Great customer service and very easy website to maneuver. Very pleased with items and service. Before ordering these 2 items I emailed Tiny Blessings with a query as I live in the UK The response was fast and helpful. The lockets arrived in good time and I am informed by the recipients that they are beautiful. The packaging is very pretty and it makes a very nice keepsake box along with the message cards.I would definitely use this company again. I purchased Heart shape Locket for my Great Grand Daughter "Emma" the week before her fifth Birthday. good taste in the purchase. I gave my grand-daughter this locket with her name engraved for her eighth birthday. She absolutely loved it and put it on immediately. It is a fine quality piece of jewelry that came wrapped elegantly. I'm so happy I ordered it for her. I received the locket I purchased for our granddaughter's baptism, and was so pleased at the quality and beautiful presentation. It comes in a pretty blue box with a white ribbon, complete with a soft bag for silver storage, and accompanying documentation. 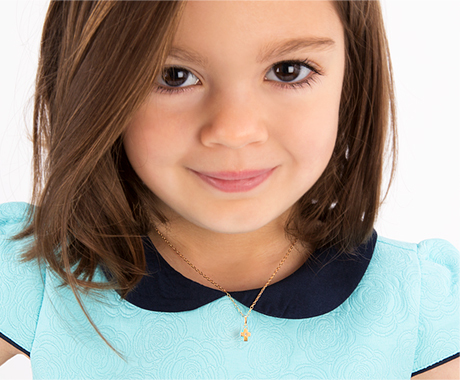 The locket itself is delicate and pretty with the engraving - perfectly child-sized, and overall a perfect gift for a child celebrating a very special occasion.